The “Flags on the 48” began as act of remembrance and a demonstration of patriotism in response to the horrific terrorist attacks that took place in the United States on September 11, 2001. On September 15, 2001, three days after the attacks, six hikers met at the White House Trailhead packing a 96 square foot American flag, 30 feet of PVC tubing, 100 feet of rope and 2 rolls of duct tape. These hikers felt compelled to do something to express their grief for the tremendous and devastating loss of lives. In a small demonstration of their helplessness and compassion in the wake of incomprehensible violence, these six hikers ascended with heavy hearts to raise the American flag from the summit of Mount Liberty. This was their personal tribute to the thousands of men, women and children who perished in the attacks. Their patriotic and sympathetic display received such remarkable amounts of positive feedback and support that a committee was formed to establish an annual memorial. The ?lags on the 48 Memorial Hike was officially brought to life. Each year, on or around September 11th, patriotic and impassioned hikers embark on a collective journey to raise American flags on all 48 of the 4,000+ foot summits in New Hampshire. This memorial hike continues to be the remembrance of the thousands of lives taken violently and unexpectedly. Participants create a moving memorial that is a compassionate show of emotional support to other human beings who have suffered heartbreaking, unfathomable loss. Since sorrow is felt across state lines, racial lines and party lines, our tribute knows no boundries. The Flags on the 48 Memorial Hike remains a small token of support for every person still trying to come to terms with the enormity of all that has been lost. We hike with the inextinguishable spirit of hope for the mending of our nation? heart. The first hike was organized as a grassroots effort by six hikers on the AMC internet message board. Since its inception this Memorial Hike has continued to be an internet based event. 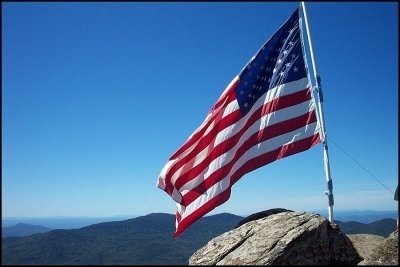 September 15, 2001 – Six hikers from AMC message boards ascend Mt Liberty to raise the American flag. September 2001 – Steering committee established to organize the official Flags on the 48 memorial hike. September 2001 – Alpinezone.com hosts subsite for Flags on the 48. September 14, 2002 – First official Flags on the 48 Memorial Hike. September 13, 2003 – Second annual Flags on the 48 Memorial Hike. September 2003 – Planning Meeting weekend established for face to face input and focus. April 2004 – Flags on the 48.org website launched. September 11, 2004 – Third annual Flags on the 48 Memorial Hike. All 48 4000 + foot peaks hosted American flags! September 11, 2005 – Forth annual Flags on the 48 Memorial Hike. Again all 48 4000 + foot peaks hosted American flags! September 09, 2006 – Fifth year of the official Flags on the 48 Memorial Hike. September 08, 2007 – Our sixth year, all peaks covered and over 200 people participating. September 11, 2011 – Flags’ 10th anniversary and the event continues to grow, over 350 people participate.